Display shows note name, tuning meter and calibration, pitch and flats. Output: 1/4" mono audio jack for signal. Input: 1/4" mono audio jack for connecting guitar. True bypass foot switch design. Connect a DC 9V power into the pedal. Link the input, and press the ON / OFF button. If you want to change the pitch, then press A4 button. the pitch varies from 430Hz to 450Hz. If you want to tune by note flat, press Flat button. Flats offer 4 steps: b, bb, bbb, bbbb. Play a single note of your guitar, the note name will appear in the tuner screen. the screen color will change, and the tuning needle will move. The center blue tuning meter appears, and 2 blue triangles appear: note in tune. Yellow right tuning meter appears, and right blue triangle appears: sharp note. The tuner has bypass function. 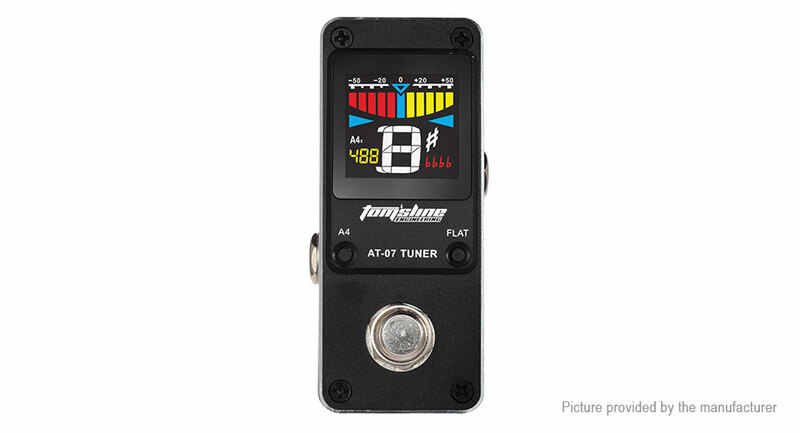 When tuning finished, on / OFF button, the original guitar signal gets through without distortion.